Scott Verner and Ed Ibarguen first met through mutual friends at the University of North Carolina in the early 1970s, and quickly formed a friendship, each with a passion for playing music. Over a holiday weekend in Ibarguen’s room on the 7th floor of UNC’s Morrison Dorm, the new friends met for an impromptu jam session. Lying on their backs with electric guitars plugged into a small Princeton Reverb amplifier, they riffed until the wee morning hours. Soon they were onto an idea. “We came to the end of something, looked at each other and said, ‘We’ve got to start a band,’” Verner said. Not long after, having found a drummer and bass player, the two formed South Wing Band. Merging a blend of Grateful Dead, Allman Brothers and their own compositions, the band became a local and regional success. “We were a big fish in a small pond,” Ibarguen said. A few years into the gig, the band “broke up for the usual reasons — money and ego,” Verner said, but mended fences and were back together within six months. The band performed for nearly seven years, Verner guesstimates, before the members grew up and got real jobs. Verner knew that Ibarguen, the band’s lead guitarist, was going to be successful wherever he landed. Could Ibarguen have made a career as a guitarist? “Yes,” said Verner without hesitation. In February, the 64-year-old Ibarguen, general manager and director of golf at Duke University Golf Club, will be inducted into the Carolinas PGA Hall of Fame in Greensboro. Outside of being elected to the national PGA Hall of Fame, it’s the highest honor that is bestowed on a PGA professional. He will be the 46th inductee and join a list that includes Donald Ross, Harvie Ward, Luke Veasey, Will Mann, Rod Myers and Peggy Kirk Bell. The honor comes at the latter stages of a career in which Ibarguen has been lauded for a wide range of talents within the golf industry. Nationally, Ibarguen has already received the PGA of America’s Horton Smith Award (1998) and Bill Strausbaugh Award (1995) for his talents as a teacher and his service to the game. Also, since first being selected in 2001, Ibarguen, a Master Golf Teaching Professional, has been a constant on Golf Magazine’s Top 100 Teacher list. Within the Carolinas PGA Section, he has been selected as the Horton Smith Award winner three times and Teacher of the Year twice. Ibarguen has also won the Bill Strausbaugh Award and Professional of the Year award, as well as served on numerous committees at the section and national level. By the late 1970s, Ibarguen’s reputation as a guitarist was widespread. He was a member in a local “all-star band” called Nightshift, and was also in a regular-playing gig at the Holiday Inn off Highway 15-501 near Chapel Hill. Not only was Ibarguen playing at night, he was playing during the day. He could be routinely found at his alma mater’s Finley Golf Club. Growing up in South Orange, N.J., Ibarguen was more into football, basketball and baseball than golf. He fancied himself as “a good little all-around athlete,” he said. His father, Albert, always encouraged him to play golf if for no other reason than the doors it might open later in life. Tom Ruggerio, a junior high teacher, taught Ibarguen the game’s rudimentary fundamentals. 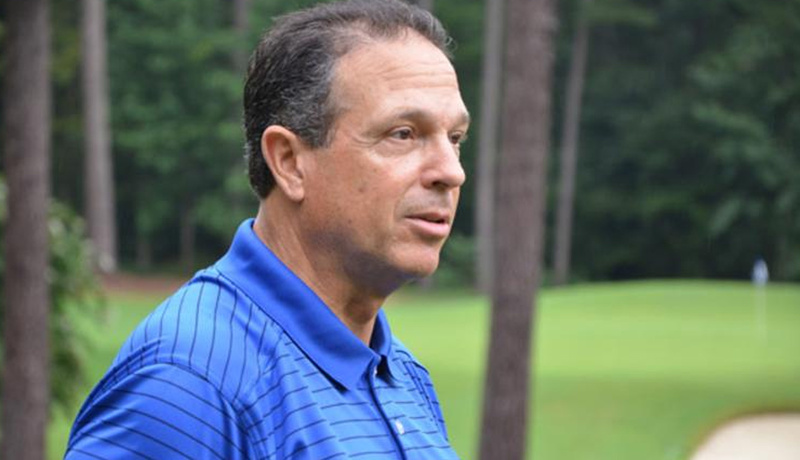 He took to the game while at UNC and eventually caught the eye of Tom Waters, the PGA assistant professional at Finley, who helped plant the seed of Ibarguen joining the PGA of America and becoming a golf professional. Ibarguen did in 1979, and when a job as an assistant professional at Finley became available, he approached Devon Brouse, who at the time was the school’s golf coach and the course’s director of golf. In 1983, Ibarguen became Finley’s head golf professional and began to flourish. Working at UNC — and later Duke — gave Ibarguen the opportunity to learn as much as he could take in. While he would travel about to learn from the profession’s top teachers, they also came to him. Sam Snead once flew in, but there were others like Gardner Dickinson and DeDe Owens. One day, Davis Love, father of Tar Heel and PGA Tour great Davis Love III, put his arm around Ibarguen and told him he couldn’t beat his son, but Love could tell that Ibarguen had an eye for teaching. While Ibarguen was beginning to establish himself, 10 miles up the road, then-Duke University athletics director Tom Butters was crafting a vision for Duke University Golf Club, the 58-year-old public access course that was designed by Robert Trent Jones Sr. The hilly, tree-lined course, like many university-owned courses throughout the country, had become tattered and worn, mostly operating in debt because of discounted rates to students, faculty and staff. Butters’ first move was to bring the course under the athletic department’s umbrella so it could be renovated and brought up to the standards of the university. The university was also in the process of building the Washington Duke Inn adjacent to the golf club. Rod Myers, the Blue Devils’ men’s golf coach and director of golf, called Ibarguen and asked that he come interview for the new position. The selection committee included Butters and Schmid, the former head golf professional who had transitioned over to executive director of the Iron Dukes, the athletic scholarship fund. Butters was well aware of Ibarguen’s growing resume, but needed someone who could make the course a successful business and make it “a place that Duke University and its alumni can be proud of,” Ibarguen remembers him saying. Ibarguen was fine with that challenge just as long as he would be allowed to stay involved with the PGA of America at both the section and national level. He also had one other caveat: If Ibarguen took care of business to Butters’ expectation, then he would also be allowed to give lessons every afternoon. They had a deal that has lasted 27 years. Ibarguen jokes that for the past 15 years he’s been telling his staff that he will work for another 10 more years, and he recently informed them again. Carter Jenkins, 20, who won an unprecedented third consecutive Carolinas Golf Amateur championship this summer and is currently a junior on North Carolina’s men’s team, has been under Ibarguen’s tutelage for nearly 10 years. Jenkins has also heard the stories of Ibarguen being an accomplished guitarist. Ibarguen may be a bit cleaner cut these days, but he never fully gave up on the guitar. About a decade ago, Ibarguen reunited with a few members of the South Wing Band. The band made a vanity CD, “Love Resurrection,” and routinely plays at charity events and street fairs.